As many customers do ask, here's a little "potted history" and some background information on this exciting new tartan, with apologies to better historians than me for the bits I've undoubtedly got wrong . 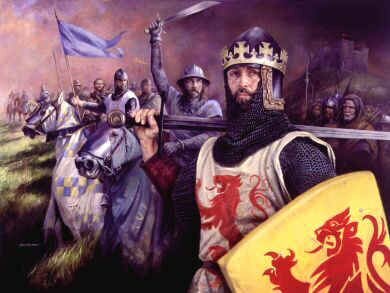 . .
Every Scot knows the date - the 24th of June, 1314 . . .
. . . King Edward II of England marched his huge army into Scotland on the pretence of relieving Stirling Castle, but with the real intention of meeting and destroying the Scottish army in the field. His 3,000 knights and 16,000 foot soldiers, along with foreign mercenaries, left a trail of cruelty and destruction on the march North and were guilty of what we would nowadays consider war crimes / ethnic cleansing, such as at Berwick on Tweed where everyone they could find was murdered and the corpses left hanging out of their windows as a "message" for rebellious Scots who may pass through that important border trading town. Unfortunately for him, the "message" was heard by a certain King Robert I of Scots (Robert the Bruce), whose army was no more than a third the size of the English. The armies met just outside Stirling at the famous Bannock Burn (burn meaning stream). 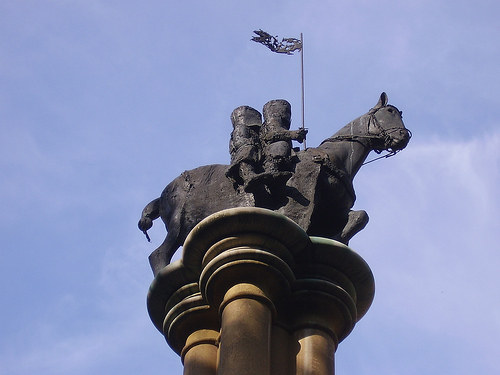 We've all seen the movie "Braveheart" but the truth is no less impressive . . .
. . . it started when the English knight Sir Henry de Bohun, a nephew of the Earl of Hereford, caught sight of the Scottish king, lowered his lance and charged. The Scots army were lined up and watched as de Bohun's huge war horse thundered towards King Robert, mounted on a small palfrey, wearing no armour and armed only with a small battleaxe. 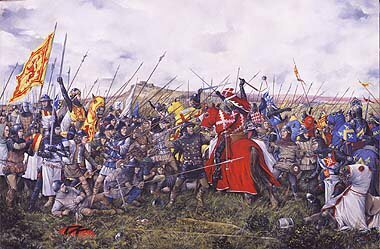 There was considerable anxiety in the ranks as it seemed certain the Scots king would be killed even before the battle started, but Bruce stood up in his stirrups and struck so hard with the battleaxe that it cleaved the English knight's helmet open. The Scots commanders rebuked him for his recklessness but Bruce's only regret was that he had split the shaft of his favourite axe! Outnumbered and outarmed, the Scots ranks were given a massive and crucial boost in morale. This famous incident came to symbolise the war itself - the one side large, heavily armed but lacking agility while the other was smaller, but highly mobile and open to opportunity. The English army was all but annihilated with some 11,000 of the 16,000 foot soldiers killed by the end of the battle. In fact, most of the survivors to reach Carlisle were Welsh spearmen who, it has often been suggested, were perhaps not as willing to fight and die for an English king. The victory of the Scots army strengthened Robert the Bruce's position and within 10 years Scotland's fight for independence was achieved. For those who like their history with a twist, interesting comments by a monk who witnessed and chronicled the battle have only fairly recently been more fully understood. Some say this is a purely romantic addition from around the start of the 18th century but I'd argue that as Scots and Gaelic culture and history was of the oral tradition, the fact that written records only seem to surface around 300 years ago does not mean that there can be no truth in the account. Not everyone agrees with this intepretation and we occasionally we even receive a heated email from more traditional historians, but I offer the story here purely for the sake of adding a fascinating dimension . . .
. . . at the crucial point in the battle with the English heavy horse thundering towards the Scottish lines, the command was given and the Scots schiltron raised their banks of huge sharpened pikes and spears (again, we've all seen "Braveheart") but this action alone was not enough to save them from the English horse. As the chronicler says: the front ranks opened to allow the Scots horse on to the field, wearing their white mantles. What "Scots horse"? Mounted knights were hugely expensive and each knight required a small team of men on foot; it cost a fortune to equip and operate a single knight - the middle ages equivalent of a stealth bomber. Scotland didn't have very many of these knights, although it would be equally false to suggest that all Scots knights rode ponies as King Robert did - the Scots army certainly included some formidable knights, but just not very many, and certainly nowhere near enough to face off the English horse and play any decisive role in the battle. The rules of heraldry were not just vague concepts - certainly not fasion statements - they were strictly adhered to and the only knights allowed to wear white mantles as part of a coherent unit were those who belonged to the Order of the Knights Templar. There is no real historical argument on this point. 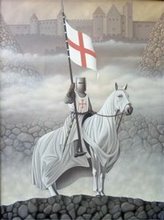 The Knights Templar were the best trained and most experiened fighting force in the world at that time. If anyone was able to face off the English horse, then it would be them. It's all beginning to sound a little "Da Vinci Code"-esque, but could there have been such a connection? Actually - yes - because following the disbandment of the Order and the arrests of Templars throughout Europe (Friday 13th October 1307), many sought refuge in Ireland and Scotland. Scotland offered ideal refuge because Robert the Bruce had been excommunicated, so the Pope's influence did not extend to Scotland at this time. In return for sanctuary in Scotland, the legend is that the Templars vowed to deal to fight for Bruce whenever the need arose. This legend has survived in parts of Scotland for 700 years but only recently have historians been able to confirm the significance of knights wearing white mantles and of Templars actually living on the West coast. If you ever get the chance to visit Scotland's far West coast you will find Templar graves dotted throughout the area... I've seen them everywhere from the Mull of Kintyre, up through the famous Kilmartin glen and churchyard, past Loch Awe and even as far North as the Isle of Skye. Not everyone may agree, but the idea of Knights Templar turning the tide of the battle in favour of the Scots is not nearly as strange as it may at first sound, or as daft as some historians have suggested. As for the tartan itself, the Pride of Bannockburn is a modern tartan taking its inspiration from the Battle . . . the green of the highland hills in the distance (the line dividing the highlands and lowlands begins at Stirling), the purple of the heather, the blue of the Bannock Burn (stream) itself (although it flowed red by the end of the battle) and the white of the mantles of the Knights Templar (or of the Scottish saltire if you don't care for the alternative history). 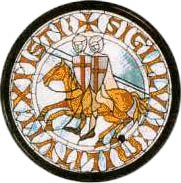 The seal of the "Poor Knights of Christ and of the Temple of Solomon" (the full name of the Order) depicts two knights sharing one horse, representing their poverty (individual knights were poor, having given everything to the Order, making it massively wealthy). This device is found throughout Templar history, including the famous monument outside Temple Church in London, and is reflected in the twin white overcheck of the Pride of Bannockburn Tartan. Pride of Bannockburn Tartan Ribbon is an excellent alternative to many other modern tartans including Pride of Scotland, Thistle, Heritage, Western Isles, Freedom, Scotland Forever, Spirit of Bannockburn, Isle of Skye, Spirit of Scotland, Saltire, Bute Heather, Forever Scotland, Honour of Scotland, Scottish Spirit and (no doubt) many more tartans. Pride of Bannockburn Tartan Ribbon is substantally less expensive than the price of Pride of Scotland Tartan Ribbon.